Penn State ended a seven-match losing streak against Nebraska, winning in five sets at home, while Illinois picked up a key home win over Wisconsin in four. 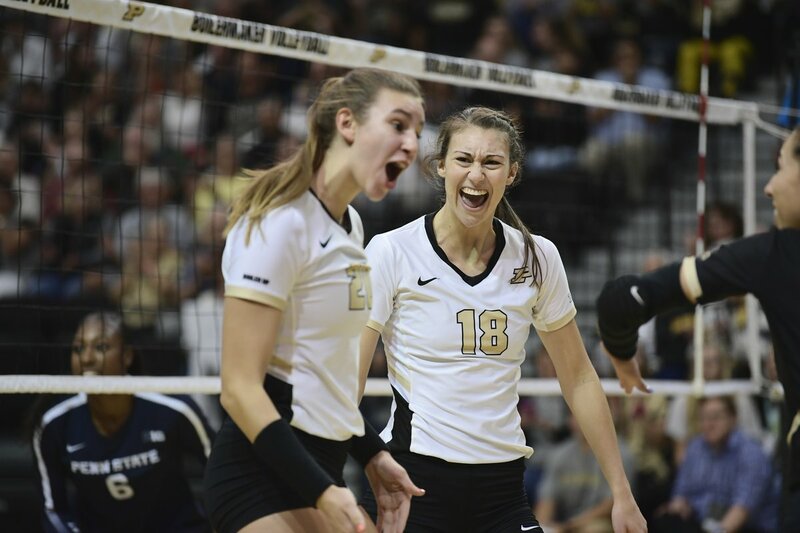 Purdue outlasted Iowa on the road in five, while Minnesota’s Samantha Seliger-Swenson crossed the 5,000 assist plateau in a sweep of Northwestern. The Hawkeyes packed in 4,058 fans to Carver Hawkeye Arena for the match, the third largest crowd in program history. Purdue outhit Iowa .254 to .192 in the match, including .333 to .000 in the decisive fifth set. The Boilermakers also led the way in kills (74-57) and blocks (9-6), but trailed 4-3 in aces. Grace Cleveland posted a career-high 19 kills to pace a group of four Boilermakers with double-digit tallies. Sherridan Atkinson (17), Caitlyn Newton (14) and Blake Mohler (12) followed. Cali Hoye (14), Reghan Coyle (13) and Taylor Louis (13) paced the Hawkeyes. Hoye rounded out a double-double with 10 digs. Atkinson downed five kills in the final stanza as Purdue grabbed a 5-1 lead and held on for the 15-10 victory. The Illini boasted a slight advantage of Wisconsin in every way: kills (66-63), hitting efficiency (.220 to .210), aces (8-2) and blocks (15-13). Jacqueline Quade paced the Illini with a career-high 26 kills, nine digs and four blocks. Megan Cooney and Ali Bastianelli chipped in 11 kills apiece, while Jordyn Poulter notched a 55-assist, 13-dig double-double. Dana Rettke was tops among the Badgers with 19 kills and six blocks, while Tionna Williams (12) and Grace Loberg (10) also posted double-digit kill tallies. The Badgers were within one late in Set 4 at 24-23 after thwarting Illinois’ first match point try. Bastianelli closed the door with her 11th kill. The PSU victory marked the first over Nebraska since Nov. 29, 2014. That stretch included four five-set losses. The Nittany Lions won the match despite being outdone by Nebraska in every statistical category: kills (64-59), hitting efficiency (.210 to .172), aces (5-4) and blocks (13-10). Nia Reed downed 20 kills and added three blocks to pace Penn State. Taylor Leath followed with a 10-kill, 15-dig double-double. Lexi Sun notched 20 kills and nine blocks for Nebraska, while Mikaela Foecke added 17 putaways, 18 digs and four blocks. Jazz Sweet and Lauren Stivrins also turned in double-digit kill tallies with 10. The Nittany Lions made just two hitting errors in Set 5, while forcing five by the Huskers, outhitting their foes .222 to .071. Minnesota owned the net in the match, outdoing the Wildcats .345 to .105 in hitting efficiency, which boasting a 46-34 lead in kills and 12-3 advantage in blocks. Northwestern bested the Gophers 4-1 from the service line. Regan Pittman (11), Adanna Rollins (11) and Stephanie Samedy (10) paced the Gopher attack, each hitting .250 or better, led by Pittman’s .500 effort (11-2-18). Samedy rounded out a double-double with 10 digs and a match-high six blocks. Minnesota setter Samantha Seliger-Swenson went over the 5,000 assist mark for her career with 40 in the contest. Alana Walker was the lone Wildcat to notch double-digit kills with 10, while hitting at .450 clip. Nia Robinson added nine putaways, but hit just .111. Britt Bommer turned in a 28-assist, 12-dig double-double. Samedy posted four kills and a block in a 25-19 Set 3 win, including the final putaway on the Gophers’ second match-point try. A combined 23 blocks (13-10 IU) and 52 combined hitting errors made it an ugly match. Indiana outhit Rutgers .135 to -.029. The Scarlet Knights downed 29 kills, but made 32 hitting errors to hit in the negative percentile for the match. The Hoosier hit .161 and .171 before ending the match with a .062 clip. Kamryn Malloy downed a match-high 10 kills, hit .333 and pulled up nine digs. Deyshia Lofton added eight putaways and seven blocks, while hitting at a .538 clip. Anastasiia Maksimova posted seven kills and hit .182 for the Scarlet Knights. Inna Balyko notched 23 assists, nine digs, six blocks and three kills, while hitting .600. Indiana bookended its 25-23 Set 3 win with 5-0 runs. A solo block and kill by Lofton highlighted the final rally, while Victoria Brisack ended the night with an ace. According to your current Big Ten standings, Minnesota is 8-2. When did those 2 losses happen, and to whom? Hi Steven, it was an error in the copying and pasting. It has been corrected now.